I joked on Gordon’s post about divination recently that I’d finally had a weird sync with him, because I was making a “broidered coat of scarlet, blue, and gold.” But I was doing so. I’d decided, on the advice of several seamstresses and tailors I know, to go ahead with a project that I’d already done and didn’t like. That project didn’t turn out well, but my friend Jen commented that muslin was the wrong kind of fabric for this project, and that I hadn’t put in a lining, and those were probably the reasons that it didn’t hang right. She’s probably not wrong. 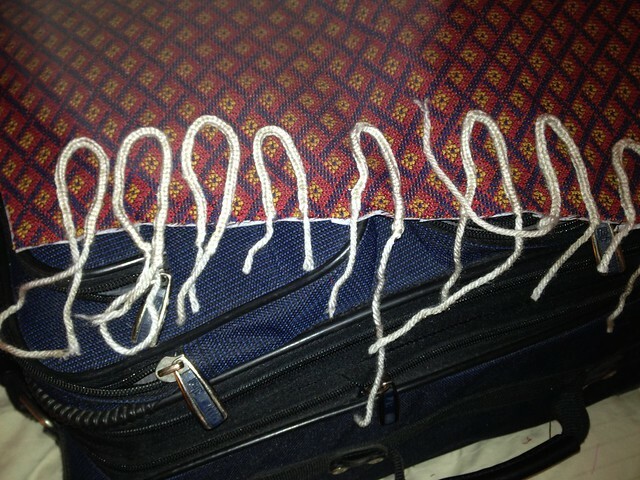 A look at the muslin shows this. It’s flimsy and weird, and the edges aren’t finished at all, and the cuffs of the button-on sleeves don’t hang properly, ad nauseam. It’s ugly. But I’m in Florida this week, helping my mom get ready for some minor surgery. And I was reminded that I bought the fabric I here for 35% off the already 50% discounted price for a remnant — it was in the clearance pile, and some wealthy matron in Florida has a matching sofa in this fabric somewhere. And that’s an odd thought. 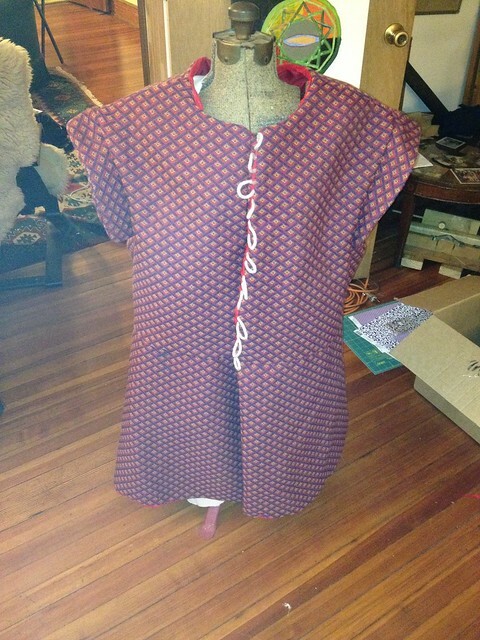 But I bought the fabric, and then I went looking for a pattern that I could use with the fabric…. and this coat or Tudor doublet pattern came to me for about 35% off during a patterns sale at a fabric chain-store that you can find all over the country. I’m still not sure that I like this doublet. I still have to assemble the sleeves. And my iron and ironing board are simply not up to the task of pressing this ‘broidered coat’ properly, so that those button loops lie flat. And I still have to attach the trim that I used my lucet to make (and lucets are a useful part of cording work in and of themselves). Because the cords have to be fastened in place quite early in the process, and then the lining and the outer fabric are sewed in place around them. This makes it look all messy and weird at the beginning, but gradually they become more clearly defined and integral to the garment as a whole. I’ve made a whole bunch more of this white cord, which will lace the sleeves to the doublet, and trim the cuffs of the sleeves and the lines of the shoulders. But I also think I’m likely to run out of this particular wool before I’ve finished all the trim. Which means I’m on the lookout for more of this sort of wool — even though I don’t have the wrapper it came in, and can’t tell you the dye lot, the color, the manufacturer, or the source of the material. Which is sort of a complicated difficulty. But these are the challenges that a designer goes through. 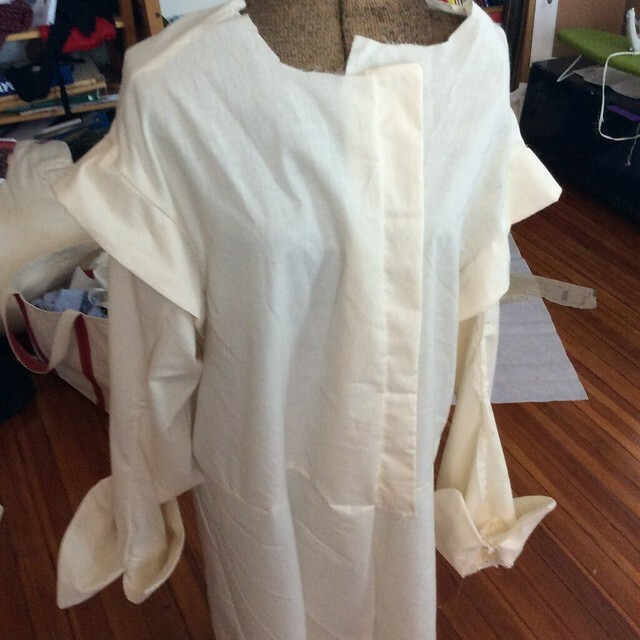 Find the material, find the pattern, imagine the whole garment complete, do some first drafts and maybe some second drafts, make modifications, and — ultimately — build the thing and see how it turns out. It almost never turns out as you think it should. There are always mistakes and mishaps along the way. Mine include not getting accurate measurements on the cutting of the lining and the cutting of the peplum or lower skirt of the doublet. The result are these awkward gaps or drapes or folds in the fabric on the back, which may come out after a really good pressing, or may be built into the doublet for now and for always. The solution may be a good pressing, or making a short cape to go with the doublet to act as an additional element of the design. I don’t know. Before I send it out to be professionally pressed, though, I have a few more small corrections here and there to make. 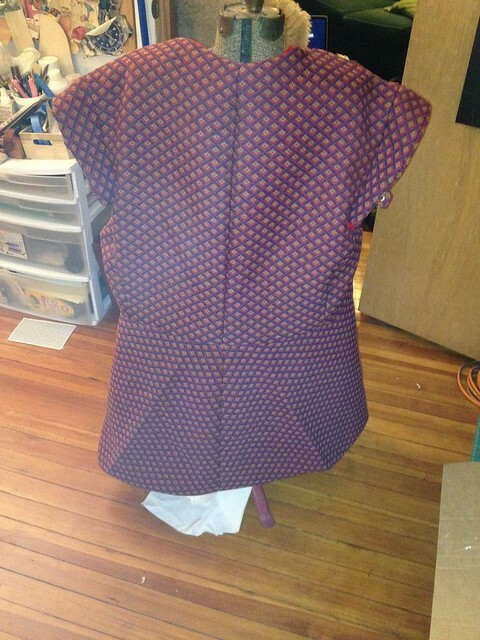 It needs a bit of tailoring under the sleeves, and I want to add the trim: then I can use the stitching of the trim to help fix some of the seams in place, and help flatten the garment the way I want it, before it goes into the press. Find a material you want to work with. Have an idea you wish to bring into being as a physical or software object. Have an insight about a thing or process that should exist in the world. Begin looking for a new project. Nine steps. Or, maybe seven. Or maybe three. Or maybe sixteen. Or maybe twenty-six. There’s lots of ways of approaching this. But really it comes down to imagine – make – reflect – do again. Definitely better! Getting it professionally pressed at this point is only going to do so much. I would highly recommend working with a good iron whenever you can and getting a pressing ham for working on curves. Once a garment is completely constructed with a lining, you can’t really press the seems open properly. Looking at the “peplum” and the creases in it, I’m curious about what the pattern asked when it came to placing that piece on the grain of the fabric. Is the waist seamline really curved? The folds just seem to be at an odd angle. If the pattern has that in two pieces instead of four, I guess it could come out that way. I would have done four to avoid bias issues. All in all though, huge improvement! I will check what the pattern asked for when I get home, for the peplum. I had a feeling that maybe something was screwy, there. The fabric itself did not like being ironed. It would press flat sorta, and then almost immediately pop free… Some kind of polyester weave or netting, into which the red, blue and yellow had been woven?? I don’t know. I only know that my small iron, and small ironing board, were simply not up to the challenge of pressing and holding a crease. All the same, thank you for your praise of my improvements.